Great location, super comfortable beds, and super amazing host. I will definitely be back when I visit Florence again. Best hostel I have ever seen. Amazing hospitality, service and location. Would definitely recommend. One of the best hostels I've ever stayed in!! Beautiful, clean, and thoughtfully designed. It's not in the main historical center of Florence, which I think is actually better! The surrounding area is less crowded, close to the very cool and less touristy neighborhood of San Niccolo, and still just a pleasant 10-15 minute walk to all the main sights in the city center. All-in-all, loved it. We really enjoyed our stay. Really nice location only short walk from centre but nice and quiet at the same time. Our four bed dorm was super clean and cute! Bed very comfy and bathroom very nice and clean. All the staff were really lovely and I would definitely recomend!! Absolutely loved my stay here! Very comfortable rooms, great breakfast and lovely people. A bit of a walk from the train station but only 20 mins back into the centre of Florence. Very close to walk up the hill for an amazing view of the city. Would definitely stay again! Such a beautiful little bed and breakfast! I cannot rate this place highly enough! The rooms are quiet, and the beds are comfortable. 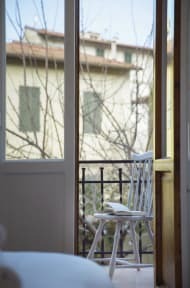 The breakfast is lovely and the bed and breakfast has such a beautiful atmosphere with old jazz music playing at breakfast which looks outside to a small grassed area. Staff are super friendly and helpful with any questions you may have. Roughly 20 minutes walk along the river to the main centre of Florence. I will be staying here again! Beautiful place. The house is pretty, well decorated and the bed/bedroom was very good. Breakfast was great. Simona and the staff were very helpful and friendly. Really cute little place, a bit far from the train station, but the walks are lovely. Really enjoyed our stay here. 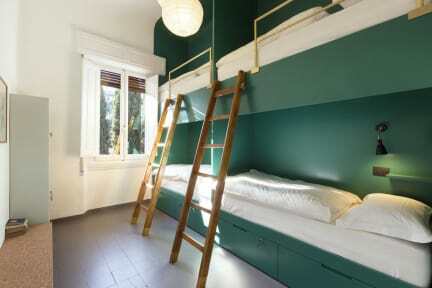 Really solid hostel in Florence! All the facilities seemed brand new (I believe it only opened in 2017), and the place is super clean. Beds are comfy with individual book lights and power outlets. Bit of a walk to the city center, but the bus is easy and close. The building layout wasn’t the most effective for a super fun social environment (common room is in the basement), and guests can’t use the stove, but other than that, this hostel deserves its great rating! I’d stay here again.